I never managed to get this finished when it was current, so everything in this post happened about a month ago now. But it was also just sitting there, one paragraph away from completion, so here goes! Can’t let a nearly finished post go to waste! I was initially drawn to the particular holly bush where I found all the insects pictured here because I walked past it and caught this fly out of the corner of my eye. I ran inside to get my camera, but by the time I got back it was gone. I spent kept looking for another one because I liked the pattern on the wings so much. Thankfully my persistence paid off! I only got the back of the fly in the photos that weren’t horribly blurry, but such is life sometimes. At least you can see the gorgeous wings that drew me to this fly in the first place. What a beauty! 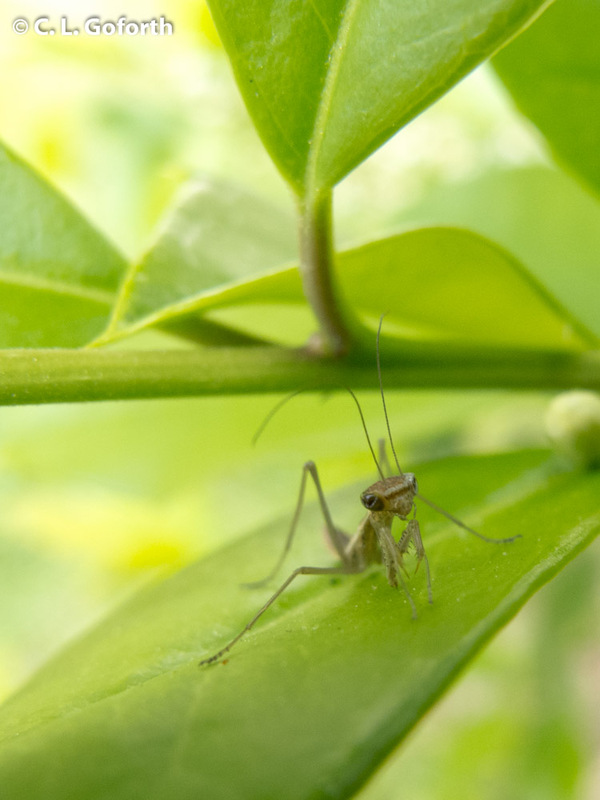 There’s something about this mantid that I found especially adorable. It wasn’t doing the normal mantid thing where it nervously skittered away the moment I brought the camera near it. Instead, it just sat there on the leaf, boldly holding its ground as I stuck the camera right up in its face. I imagine the blooming holly was a very, very good location for a little mantid nymph to set up shop, like an mantid all you can eat buffet of little prey insects. I never did get to see it eat anything, but it wasn’t for a lack of trying. Maybe his sluggishness was due to overeating? 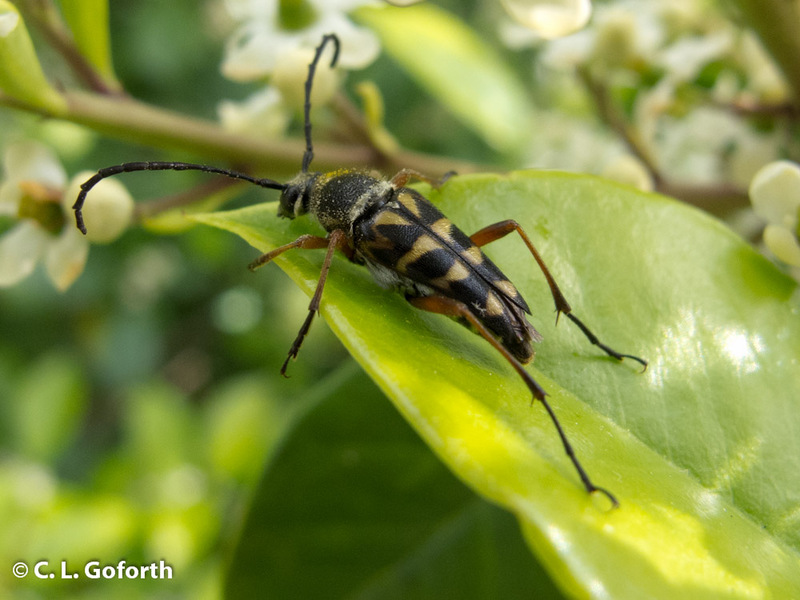 Who doesn’t love a good longhorn beetle? 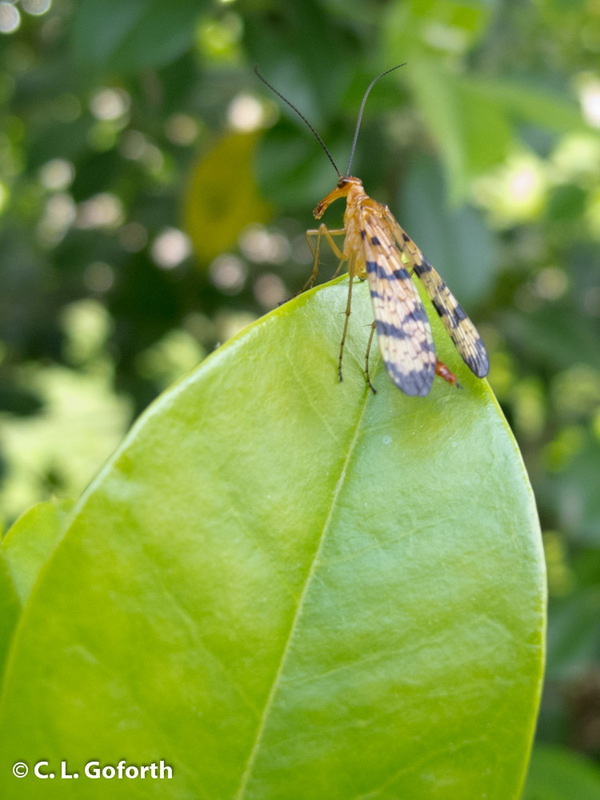 They look so elegant with their slender antennae that nearly double the length of their bodies. This particular longhorn is in the Typocerus genus (likely T. zebra), a group of longhorns that feed on wood as larvae. I’ll be honest though: I mostly snapped a photo of it because I thought it was pretty. Sometimes you just have to admit these things to yourself. There were dozens of other species hiding in the holly while it was blooming, predators, nectar feeders, and insects that simply sought a place to rest for a moment or to seek shelter from the near constant wind. The bush was absolutely crawling with insects! I’m sure this image will be horrifying to some of you, but I thought it was marvelous. What a sight! Can’t wait to see it again next year. Nice! you are right, it is a March Fly. Good job! 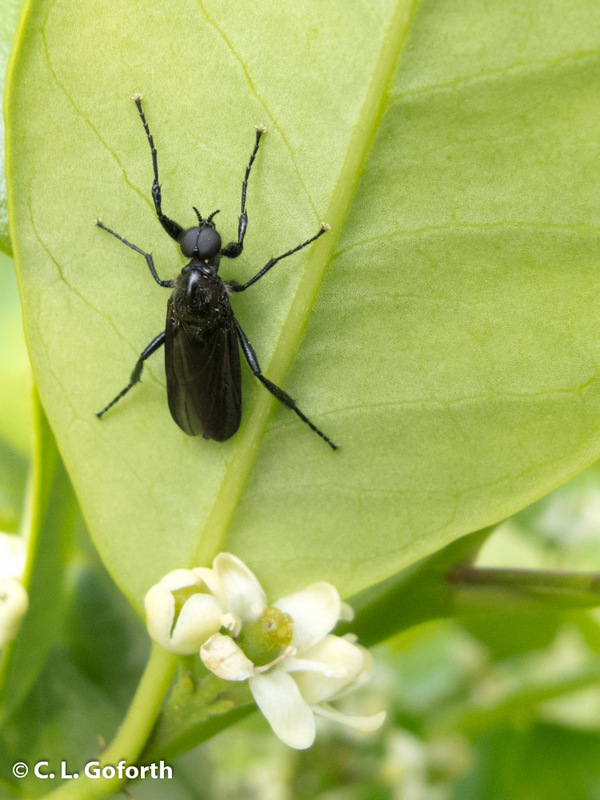 The other fly is Delphinia picta, a picture-winged fly in the family Ulidiidae. Great finds all around! Ooh, thanks Morgan! I thought it was a picture wing, but I guess I didn’t actually include that in the post… Regardless, I’m always glad to get your help with my flies! Great pictures. Do you collect dead insects? I am having a hard time coming to terms with the advice that you need a collection if you want to ID and study bees. There are a lot you cannot ID from a photograph. I will collect dead insects from time to time, yes. However, when I say you need to collect to get a really good ID on an insect, that doesn’t necessarily mean you have to kill what you’ve collected! A lot of insect identification is based on tiny structural differences, and you need to be able to take a very close look at specific structures on some insects that you can’t see in photos or just by looking at them to be able to ID them with reasonable certainty. However, you can often look at those structures on live insects, and then simply release them back into the wild. For example, there are some dragonfly species that look so similar that you have to get them into your hands to be able to tell them apart. You can catch the dragonfly, look at the parts you need to see to get an ID, and then let it go without any harm coming to it. 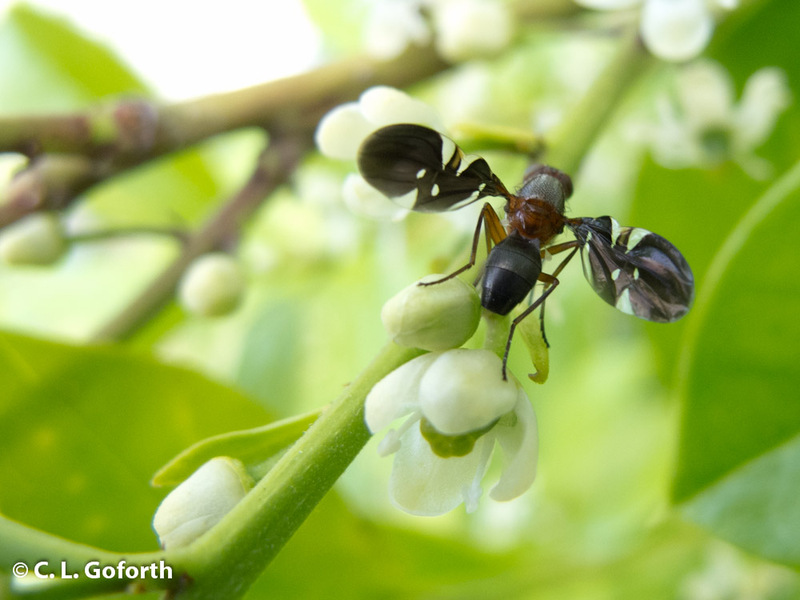 So, I don’t mean to imply that you either can’t use photos to ID insects (you can in many cases!) or that you have to capture and kill things to get the IDs, just that for some groups you’re relying on subtle, tiny differences and you have to get a good look at specific structures to ID them properly. Make sense? It does make sense but if I want to look closer to differentiate some of the bee species it does involve some fiddily bits that you couldn’t do on live bees. The advantage of dragonflies is that they are big and I can imagine you having a good look then letting them go. It is a good point though, I have caught some bees and put them in the fridge for 20 minutes which keeps them quiet for a bit before I let them go. You’re absolutely right about dragonflies – very easy to see most parts on them by just holding their wings back and getting up close! Bees… They’re a lot harder to do live for sure, plus there’s the whole stinging thing to consider. Cooling them down is a great idea, though I myself am not opposed to killing a few insects for good reasons. I know people who are, and I respect that choice, but I think that sometimes it’s more important to kill a few insects to get a good, solid ID than it is to leave them be, guess, and risk being wrong, you know? I think as I go along I will have to bite the bullet and take some to learn more to get a good ID. Well, good luck. Perhaps you can at least take some small comfort in the fact that, except under very rare conditions, you won’t be harming the population by taking just a few specimens? I think that is right and I have to have a more balanced idea that the few I might take could never would never hurt the population. Wow, and all our hollies had was scale. Icky, icky scale. That’s too bad! We recently lost one of the hollies to a wind storm, so we’re down one, but they’re looking pretty good. It’s really amazing how many different species you could find, even on that single bush! Reminded me of the creosote in the west, or desert broom, both crawling with insets when they bloomed. Chris – I wanted to introduce you to a fellow blogger, Steve Schwartzman. I’ve been following Steve’s work for a long time and he’s been incredibly patient giving pointers to myself and others. Anyhow, from time to time he can’t identify an insect. I passed your name along as someone who knows bugs and is passionate about blogging too. He e mailed me a few days ago, so we’ve been in touch. Thanks for sending him my way! His flower photos are gorgeous! I’m glad to hear that. I wanted to give you the recommendation so you know he’s a person of considerable accomplishment and not just some blogger who doesn’t want to do the work himself. Unfortunately, not everyone is worth spending one’s precious time to help out. Speaking of which, I found another neoscona spider, this one at the botanical gardens. It had the same distinctive markings as the one you helped me identify, but was half the size. Same type of huge web though. Nice! Those are great spiders, aren’t they? Love ’em!